Tempt me with attention-grabbing metalized gold plating. It's twinkling gold all over that's combined with our plush Penguin Super Silk* to create one irresistibly classy desk flag. L-shaped attachment with a 4" slitted staff perfectly fits into it's 10" vertical staff along with the flag that maybe replaced/interchanged. 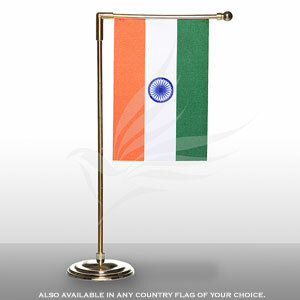 Flag readily inserted into it's L-shaped gold-plated moulded plastic staff & round finial top. Round gold-plated moulded plastic base.